Does your shop offer alignment service? We often hear from customers who change and balance tires, that they do not have the space to offer alignment services to their customers. They either sub-contract their alignment work or recommend that the customer take their vehicle to a competitor for an alignment. Both options can easily result in the loss of that customer to a competitor. 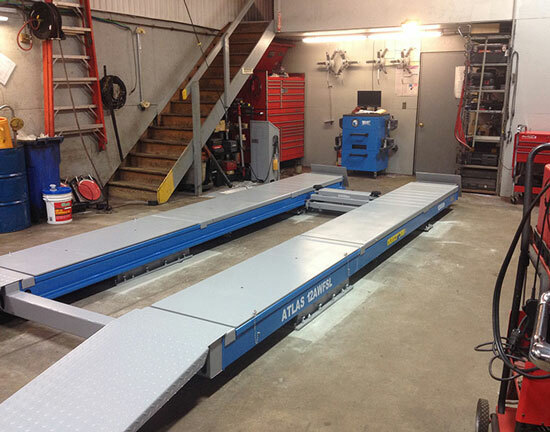 An Atlas® Alignment System (pictured above) allows the customer to utilize a minimum amount of space and still be able to align the smallest foreign car all the way up to a one ton dual rear wheel pickup truck. There is no need to roll a vehicle back and forth to obtain lateral run-out compensations. In fact, when you use the 3-point Fast Clamps, there is no need to either raise the vehicle or roll the vehicle. Since no lateral run-out compensation is needed, accurate alignment measurements can be obtained in about two (2) minutes. Shops with limited bay space should not be excluded from offering alignment services. Shops can offer profitable alignment services without adding additional bays or expanding existing bay space. Atlas® Alignment Equipment costs about 50% less than equivalent alignment equipment offered by Hunter®, Snap-On®, and John Bean®. If you have been putting off buying alignment equipment due to limited floor space or a limited budget, please call the professionals at Greg Smith Equipment to discuss how your shop can be more profitable (and retain customers) by offering wheel alignment service.